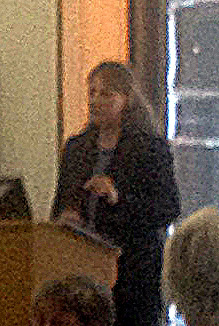 The findings and calls for a rebalancing of sanctions and support, review of the system and ending of benefit sanctions for disabled and vulnerable people were well received on the day and subsequently. The findings were The Guardian’s lead story that day, and were also reported in The Independent, Glasgow Herald, Prospect Magazine and various other online media. The BBC’s Sunday Politics ran a feature including an interview with project Director Professor Peter Dwyer, followed by a debate on the findings with two MPs and a city mayor. Several blogs including one by the Joseph Rowntree Foundation’s Chris Goulden followed. A major statement by the British Association for Behavioural and Cognitive Psychotherapies, representing the UK and Ireland’s five leading professional associations for psychological therapies, reaffirmed BABCT’s opposition to benefit sanctions, based on the project’s evidence. The findings publications drew 11,000 views to the project’s website, with over 100,000 tweet ‘impressions’ and 50 new newsletter subscribers. Professor Dwyer and team members Dr Sharon Wright (University of Glasgow) and Dr Lisa Scullion (University of Salford) have submitted evidence based on the project’s findings to the Commons Work and Pensions Committee’s inquiry into benefit sanctions. 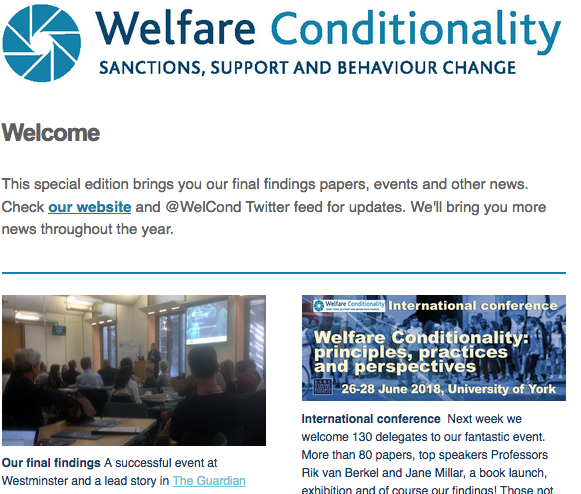 This month WelCond will host a major international conference on welfare conditionality, at the University of York. The event has attracted more than 80 academic papers and more than 100 delegates from across the world. The York team will build on the tremendous impact of the findings through the remainder of the year by meeting key policy and other stakeholder contacts to discuss the project recommendations.